One of the "Mighty Five" National Parks located in Utah, Zion National Park may be the mightiest in terms of the amount of yearly visitors and the variety of hiking trails it offers. 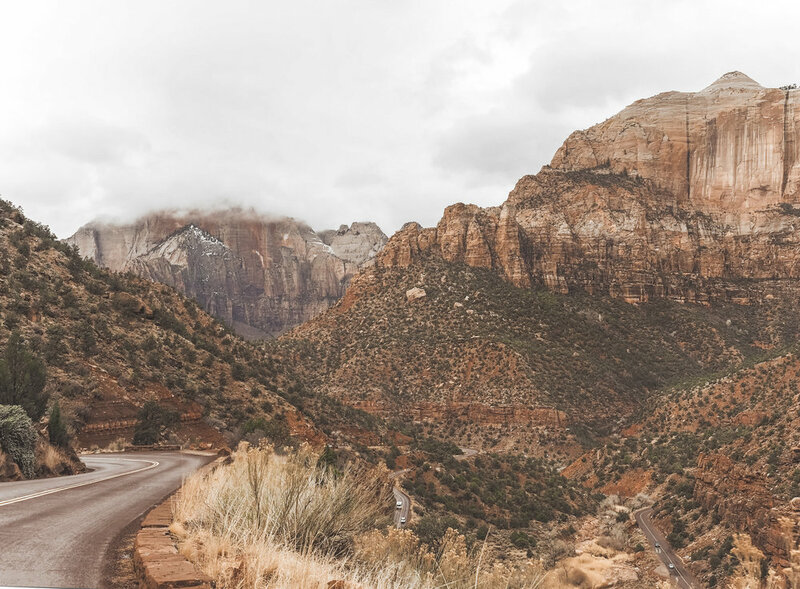 From adrenaline junkies to casual hikers, Zion has tons of trails that range from beginner to moderate and strenuous, plus you're constantly surrounded by towering mountains on all sides. It's an amazing place to spend a day and an easy drive from Bryce Canyon National Park if you want to continue your outdoor adventure. As Utah's first National Park, Zion is a sight to behold. The best way to first experience Zion is to drive in from the east on Route 9, the Zion-Mount Carmel Highway. This may be out of the way for some but trust me, it's 100% worth it. Driving in from this side instead of through the nearby town of Springdale on the south edge let's you slowly make your way into Zion Canyon by car. You'll first come across Checkerboard Mesa, a towering cliff with horizontal and vertical slits that is a well-known photo-op in the park. As you continue, you'll swerve through tight turns, wind around hills and make your way in and out of short tunnels carved out of the rock. But what's coming next doesn't even compare. If you look on a map, you'll notice that the highway route gets a little strange before it hits the park visitor center; like a kid took a pen and scribbled freely. The road seems to weave around and under itself, making sharp turns and angles that don't seem humanly possible. We came upon a deep tunnel entrance at the beginning of that stretch of road and were stopped by park rangers for a good 15 minutes. I assumed they were just building suspense but it turns out that we were in the park on one of the few weekends that larger vehicles were allowed to use the tunnel entrance. This meant that traffic was restricted to one-way going through the tunnel at a time. Finally the little caravan of cars we were a part of was allowed to move forward. This tunnel is 1.1 miles long and is literally carved out of the side of the cliff. It took three years to build in the 1920's and half a million dollars to construct. As you drive through, your car is surrounded by darkness except for the occasional opening in the cliff-side that gives you brief glimpses outside. 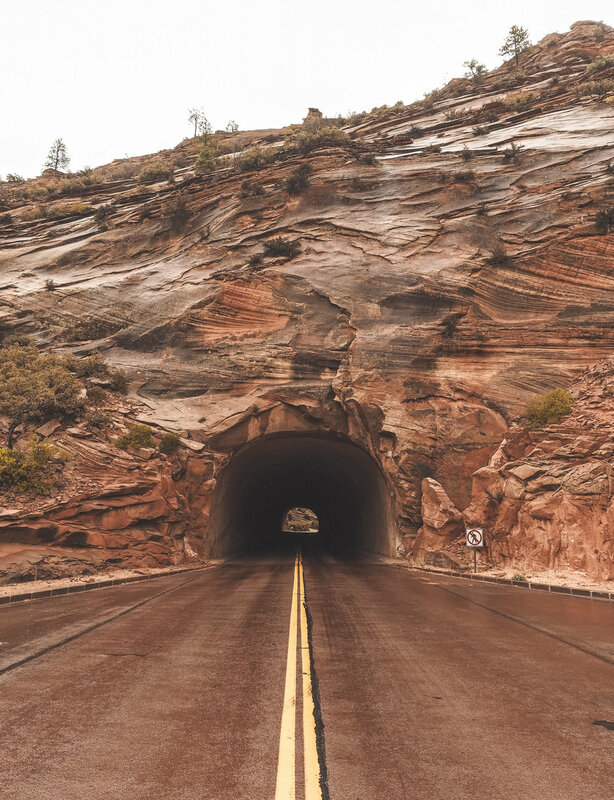 As you reach the end of the tunnel, you finally emerge into the light and the top of Zion Canyon. From here on out, you're driving that scribbly road: a continuous set of switchbacks that take you from the top of the canyon down to the bottom. Along the way are small areas where you can park your car for pictures as you come across cliffs and rock formations of all colors. It really is an amazing view and is the closest I've ever felt to being in Jurassic Park, especially with the fog and cloud cover we had the day we visited. You can follow three different points of the Mount Carmel Highway along the bottom of this photo! The Zion-Mount Carmel Highway takes you directly to the Zion National Park Visitor Center. 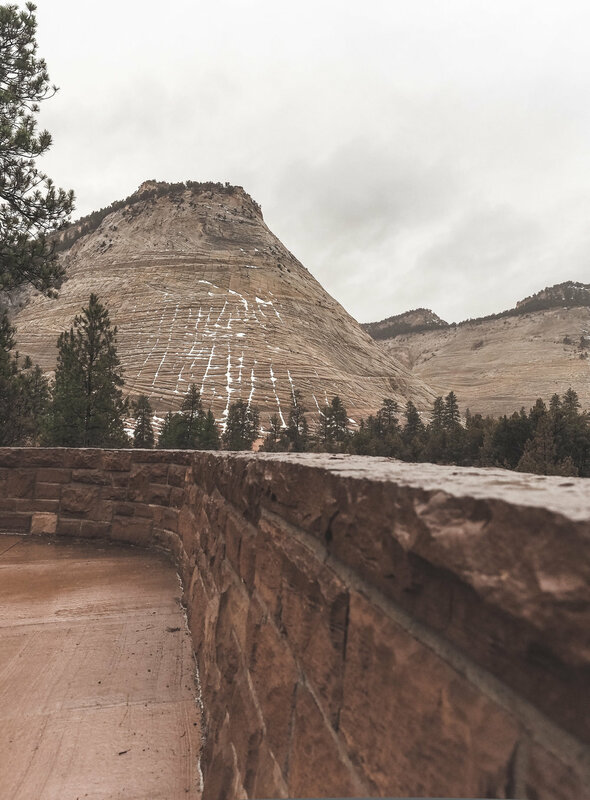 While many national park visitor centers are before all the scenic overlooks and beautiful parts of the park, often a far drive away from anything worth seeing, the Zion Visitor Center is right at the base of the canyon, surrounded by peaks on all sides. Park your car and hop on the Zion Shuttle which runs every six minutes and stops at all the major trailheads throughout the park. The Zion Shuttle cars look like they're straight out of the 70's and fit in perfectly among the rock landscape. It's a nice change of pace to not have cars ruining the natural esthetic of a national park. We hopped on the shuttle and took it to The Grotto stop to start our day of hiking. We came to Zion National Park to hike The Narrows, a beautiful trek that takes you through the Virgin River in water sometimes up to your waist, with steep canyons surrounding you on all sides. It's a strenuous half to full day hike but the views and sense of accomplishment after attempting it are supposed to be out of this world. Visiting the Park towards the end of winter, we had Mother Nature to deal with and couldn't attempt the hike due to flood risks. Instead we ended up on the West Rim Trail, one of the quintessential hikes in Zion. This hike can be shortened by backtracking the way you came or if you have a few days, you can backcountry hike the full 26.2 mile trail from Lava Point to The Grotto. We started at The Grotto and chose to hike to Angel's Landing and back for a total of roughly 4 miles. Four miles may not seem like much but the hike takes you up a pretty steep elevation ascent. We were huffing and puffing as we made our way up the steady two miles of switchbacks on the West Rim Trail. You'll be fully exposed to sun in this part of the hike but that means you're also fully exposed to the view of the inner canyon, which only gets better and better as you make your way upwards. Finally you'll get a bit of a break from the heat with the cool breeze of Refrigerator Canyon. There's also a lot more vegetation along this part of the hike as well as less of an incline to give your sore legs a break. Once you pass through the canyon, you'll come across the infamous Walter's Wiggles. This series of twenty-one quick and steep zig-zaggy switchbacks literally feels like your wiggling up the canyon cliff. However, the strain is worth it as you finally make your way to Scouts Lookout. This flat and sandy area was the lunch break point for many hikers as we sat down to catch our breath and take in the views. It's a great reward for such a strenuous hike and a great place to spend some time before you move on to Angel's Landing, continue the 26 mile hike of the West Rim Trail, or continue back down to the Grotto. Angel's Landing is on of the most thrilling hikes in the entire National Park system and one of the most famous hikes in the world. It's roughly a mile in length to hike to the end and back but it's definitely treacherous. The hike takes you up a sheer rock cliff with drop-offs of 800-1200 ft on each side. The kicker is that parts of the trail are only a couple feet wide meaning if you slip, there's a chance you'll fly right off one of those drop-offs. There's a chain located in the middle of the trail for hikers to hold onto but obviously that only helps so much. We visited in the first week of March and two people had already died since January falling off the edge. Although many people attempt this hike, it's important not to take it lightly. I got a couple feet up the side of the cliff while holding onto the chain and realized I did not have the mental fortitude to keep going...plus my arms wouldn't stop shaking. As much as I wanted to cross Angel's Landing off my bucket list, the fact that I'm so clumsy just walking normally made me lose confidence in my ability to hike the 4 ft wide trail. Mike kept going, making it about halfway, before he turned around. Many people ended up turning around where he did, once they saw the trail thin and the drop-offs get even more steep. -Go early in the morning when there's less people. We hoped that since it was still early in the season, we wouldn't have to deal with crowds. We were wrong. Having multiple people attempt the trail at once with no crowd control is probably what made me the most uneasy about the hike. I might be able to focus on my own steps but I couldn't control someone else falling and taking me down with them. -Wear sturdy hiking boots. Many tourists were attempting the hike with just gym shoes or shoes without traction. There's sand naturally occurring on this hike meaning it's slippery. Traction and quality ankle-high hiking boots are a necessity. -Take your time and don't feel rushed to finish. Safety first! Lower Emerald Pools: After tackling the steep ascent to Angel's Landing, reward yourself with an easy, paved trek to the Lower Emerald Pools, a 1.3 mile hike through lush greenery, waterfalls and beautiful pools of water. This hike can also be extended to see both the Middle Emerald Pools and the Upper Emerald Pools, with trails that get a bit more strenuous as you continue. Each set of pools offers a little oasis for a relaxing afternoon hike. 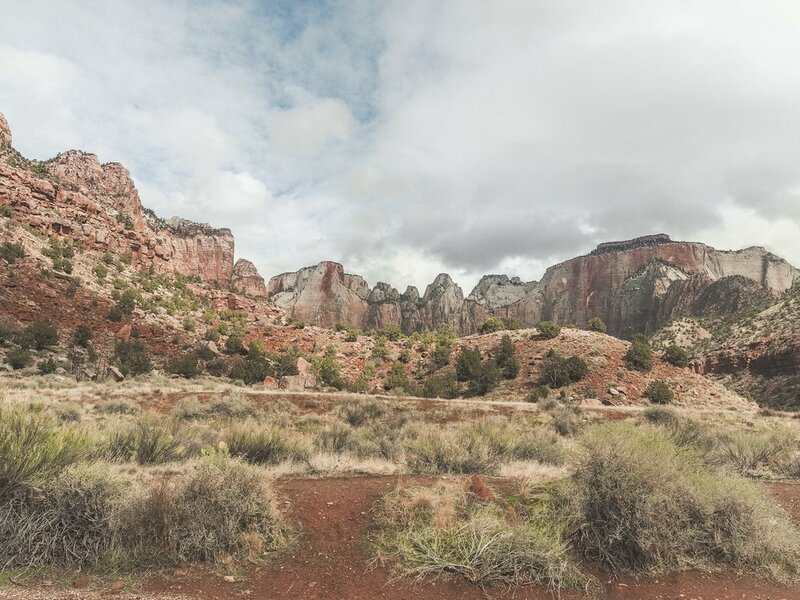 Watchman Trail: The Watchman is a classic Zion hike and a moderate 2 mile trek. It takes you up the canyon and rewards you with views of the park and town of Springdale to the south. It is fully exposed to sun so beware when hiking during midday in the summer months. Overall, Zion made it to the top of my list of favorite National Parks alongside Olympic National Park In Washington. The views are unparalleled and the range of hikes make it a perfect visit for people of all ages and abilities. Utah doesn't get much love as a state but the outdoor activities are endless. Add it to your list of travel destinations!